"Blessed are the meek, for they shalt inherit the earth." 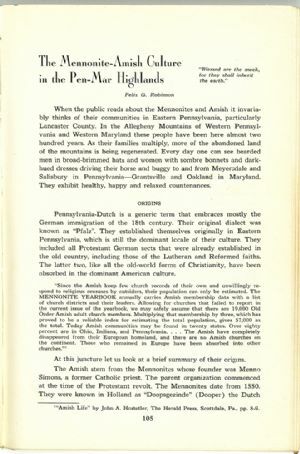 When the public reads about the Mennonites and Amish it invariably thinks of their communities in Eastern Pennsylvania, particularly Lancaster County. In the Allegheny Mountains of Western Pennsylvania and Western Maryland these people have been here almost two hundred years. As their families multiply, more of the abandoned land of the mountains is being regenerated. Every day one can see bearded men in broad-brimmed hats and women with sombre bonnets and darkhued dresses driving their horse and buggy to and from Meyersdale and Salisbury in Pennsylvania—Grantsville and Oakland in Maryland. They exhibit healthy, happy and relaxed countenances. Pennsylvania-Dutch is a generic term that embraces mostly the German immigration of the 18th century. Their original dialect was known as "Pfalz". They established themselves originally in Eastern Pennsylvania, which is still the dominant locale of their culture. They included all Protestant German sects that were already established in the old country, including those of the Lutheran and Reformed faiths. The latter two, like all the old-world forms of Christianity, have been absorbed in the dominant American culture. At this juncture let us look at a brief summary of their origins. (1)'"Amish Life" by John A. Hostetler, The Herald Press, Scottdale, Pa., pp. 8-9.